By now, you should have received our bi-annual print publication, InsideISTP. Hopefully you’ve had a chance to read through the great articles and news stories. I must admit that one of my favorite pieces is the article on our alumni students, Adrian Miner and Magali Gauthier. Since I used to be the coordinator for our former IB program, I have a soft spot for these IB students, and am so happy to see them doing so well. I love reading through InsideISTP, but I feel it’s time to ask you.... do you value the printed newsletter? 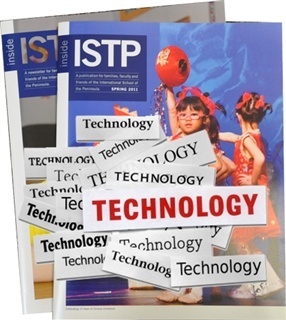 About five or six years ago, we used to have at least three annual issues of InsideISTP, in addition to our Annual Report. With an eye on reducing both waste and cost, we cut one of the issues, and added more articles to the Annual Report. Parents now receive three publications a year instead of four. I ask for your opinion because it’s difficult to ignore the popular use of electronics to substitute for print. I see many parents carrying around a smartphone, Kindle, iPad, Nook, laptop, etc. and have to ask if perhaps print is in fact, dying out. Personally, I still treasure holding a magazine or newspaper in my hand, and reading print on paper. I receive InsideISTP and put it on my coffee table, carry it with me to the bedroom, and flip through it whenever I have the time and want to unplug from tech. Conversely, I also know that reducing waste and cost is important. We have a great website and ecommunciations that constantly feed news to our community. The frequency and immediacy of this simply can’t be beat by print. By the time Jovi works on the newsletter, finishes layout and sends it to print... I have to admit that a few items are already dated. Two weeks prior to receiving the newsletter, you’ve already seen the photo galleries and received an e-newsletter about the Gala and our results. The events are on your personalized calendar. Both Kate and I write blogs, and we could easily continue to feed our website and your email box with all the great things happening at school. In light of Earth Day, it’s important to examine how we do things. Perhaps we should change InsideISTP to an annual alumni newsletter, and keep things electronic for our current ISTP families and community. What do you think? Should we make the switch? Let me know.